1 Million is one of the most popular fragrances launched in last several years. After the edition for men, women's version inspired by gold and wealth was expected. Two years after men's edition, fragrant lady finally appears - Lady Million! We can just assume if this lady wants to earn millions or look like a million dollar. It is perfectly clear that the woman represented by this edition radiates, dominates and possesses fiery character with incredible sensuality. Flacon of Lady Million is in tune with composition and theme of this edition. Instead of gold bullion, the flacon for women is designed as a golden diamond. While insinuating luxury and wealth, the fragrance prepares a surprising composition of intertwined floral, fresh and woody accords. Only diamond can compete with gold, so Lady Million is the perfect companion to modern and masculine 1 Million. The Notes of Fragrance Anne Flipo, Béatrice Piquet and Dominque Ropion have all created scents for some of the biggest names in perfumery. But what path did they take to create Lady Million? “It was clear that this perfume had to be as charismatic as 1 Million, with as strong a signature, yet without a direct olfactory link. The Lady Million woman is dazzling, always seductive. This ‘playful’ aspect inspired us immensely. 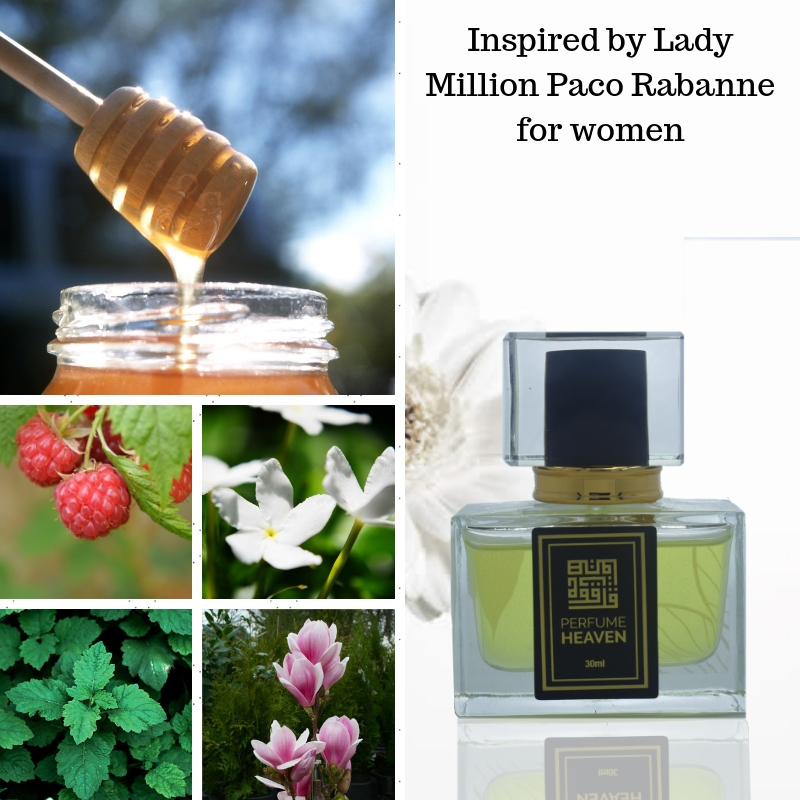 Lady Million is fresh, floral and woody, like a nectar of voluptuous flowers, trailing delicately but still very present. Powerfully seductive, the sparkle of bitter orange with a touch of raspberry reveals the first breath. A burst of neroli follows, smooth and bright. But then the lethal weapon of heady orange blossom slips out of its sheath. Its narcotic sweetness bewitches and grabs all attention. Then, joining with Arabian jasmine underlined by gardenia, the blend soars into something more carnal, yet ever subtle. Now the obsessive pulsing of patchouli enters the fray, pacifying the honey with an addictive and terribly tempting sweetness. Amber spreads to become all enveloping, floating around the beauty, following each movement and offering its most beautiful facets”. Designer of the attractive, luxurious flacon is Noe Duchaufour-Lawrance. The perfume will be available as 30, 50 and 80ml Parfum. We can expect the fragrance on the market in July 2010. Lady Million makes men's fantasy and desires come true. Advertising face is Dree Hemingway. Lady Million was created by Anne Flipo, Beatrice Piquet, Dominique Ropion and Bruno Jovanovic. Perfume rating: 3.51 out of 5 with 4230 votes.